Controversial painter Ayanda Mabulu has struck again with his latest artwork. 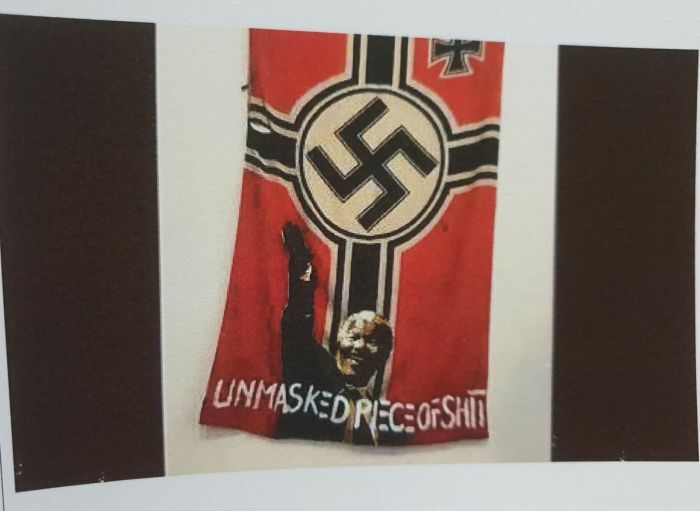 This time, Mabula has painted former President Mandela on a Nazi flag doing the Nazi salute. In a controversial debate, Eusebius McKaiser engaged Mabulu on his latest painting and spoke to Sello Hatang from the Nelson Mandela Foundation on why the foundation is against the painting. The Nelson Mandela Foundation, whenever these portrayals come through we have to think through how do we tackle the creative art without being seen to be policing it. What Hitler has done to the Jewish people in Germany, he killed them. Right now in this country, black people in this country are now men walking in the streets hustling everyday suffocating slowly rotting inside because Mandela and his cronies in the ANC failed them. Hatang extended an invitation to Mabulu for coffee so they can understand his stance on Nelson Mandela but it was not well received by the artist. Mabulu asked why the Nelson Mandela Foundation doesn't have Rooibos tea with poor people of this country? I'm not too important. They must go focus their energy on the poor and marginalised people of this country. You will probably poison me. Right now from where you are seating you will go and buy Ratex and put it in that coffee to poison me and get rid of me. I'm sorry I'm not coming. McKaiser probed Mabulu on why he has those sentiments towards Hatang and is refusing to have coffee with him, in an attempt to understand one another. This man is being paid by the Mandela Foundation and all that and he is sitting there and representing something of a huge failure and he knows it. He is fattening his pockets every month end. Mabulu continued to describe the former Statesman in his views. One of the things that Madiba has done was to create and organise charities. He made sure to stagnate our people and he created these dwarfish RDP houses where my people are now rotting and being eaten by rats. You are so idolising Mandela who right now might be rotting in hell. I'm sure even God is so disappointed to send him only to come out only wearing some shirts with foreign names to represent his people; only to find out he is going to be the one to devour them and leave them as wretches down there in the streets constantly exhibited - as some as racial society says, some monkeys with human abilities. This is what Mandela has done. And today we are highly racialised, we are looked at as poor wretches who have to be submissive to everything that is going to throw crumbs of bread. That is the legacy that Mandela has left. He might be dining with Satan wherever he is because the legacy he left us with is highly evil. @Eusebius School that so called artist. Tell him that Madiba wanted freedom for all South Africans. He helped to provide a liberal constitution. Legally, ppl now can pursue their dreams. In the apartheid days Ayanda would have been thrown in jail or worse.